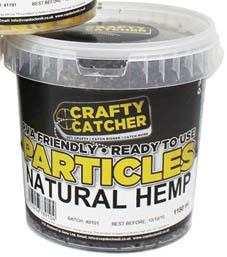 Crafty Catcher Prepared Natural Hemp are sourced in bulk direct from the country of origin and represent the very best quality available. Our unique preparation process ensures that the cooked ready-to-use Particles leak the maximum amount of natural sugars and oils into your swim. As well as having a long shelf life, the big plus with our Particles is that they are completely P.V.A. friendly and can be used in bags or stockings for effective long range accurate feeding. Perfect, of course, for spodding or feeding in the margins, this versatile range of products will help give you an edge on any water.